So I come across news stories all over. I've got an RSS feed reader. I check around Facebook. I go to a lot of different gaming company sites throughout the day. When I first saw the image associated with this story, my first thought was, "Man, Dr. Doom got some mad ups, yo!" 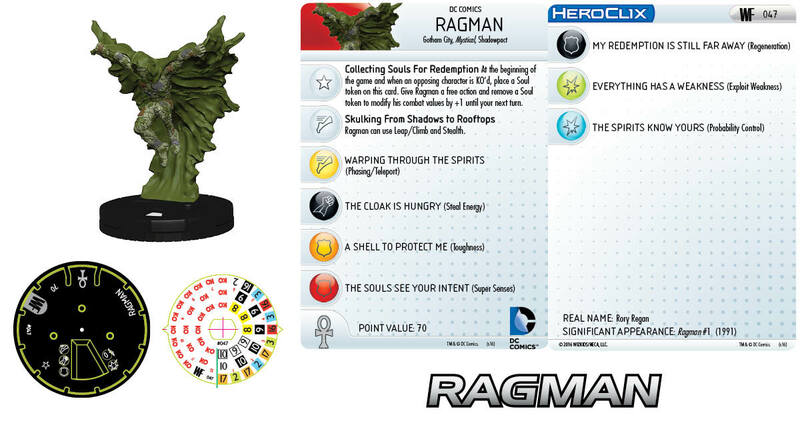 Anyway, here's a look at Ragman from the upcoming World's Finest set for HeroClix. Ragman clocks in at 70 points with a 6-click dial. He's one you'll want to keep around as you take out enemy pieces, too, since he gets Soul tokens (feel like I'm playing Warmachine now...), which he can later trade in for bonuses on his stats. He's also good about getting where you need him to go with his phasing/teleport. While not the biggest hitter ever, he might be a good addition to your squads.